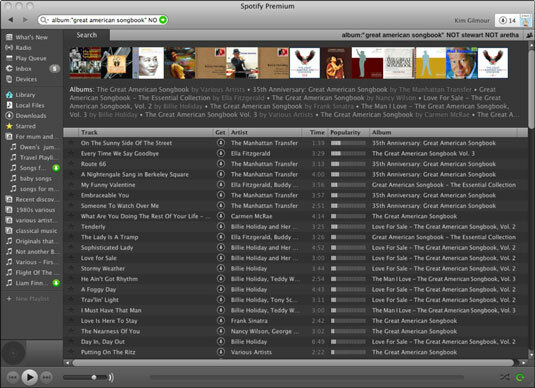 You can further refine your search results in Spotify by including different types of queries in one single search. Spotify recognizes common advanced search syntaxes, including AND, OR, and NOT. These terms must be entered in capital letters for Spotify to understand them. The plus symbol (+) in front of a word can be substituted for the word AND, and a minus symbol (–) can be substituted for the word NOT. Don’t include spaces before the keyword or search parameter when you use either of these symbols. Including AND to join up two sets of terms means the search must include both of the words (or quotes) on either side of the AND. Spotify most likely gives you results that include both words or quotes anyway, but if you want to be extra sure, always include the AND. To search for tracks by the Foo Fighters that only include Live in the song or album title, you can search for artist:“Foo Fighters” AND live. Or to search for tracks released by the band only during 2001 through 2011, search for artist:“Foo Fighters” AND year:2001-2011. The search results for artist:“Foo Fighters” AND year:2001-2011 shows that the Foo Fighters also brought out a Greatest Hits album during the 2000s that includes songs released in the 1990s. To ditch that album from the results, refine the search by searching for artist:“Foo Fighters” AND year:2001-2011 NOT album:“Greatest Hits”. You can then easily select all the results and drag them into a new playlist, if you want. You can add more ANDs, NOTs or ORs to your searches — you aren’t restricted to using each term just once. Keep adding ORs if you want to feature multiple results. For example, Supergrass OR Blur OR Elastica OR Verve OR Pulp brings up results for all of these five Britpop artists. Here’s another example. Say you want to discover some old American jazz and Broadway standards. When you do a search for great American songbook, the top results you get are a whole load of recent Rod Stewart covers because he’s released several volumes of music under the name The Great American Songbook. You also see many results from Aretha Franklin’s similar tribute. But — although you’re sure that Rod and Aretha do the songs justice — you’re really after some earlier or more original versions. You can find plenty of other albums called Great American Songbook. You still get the occasional modern tribute, but the results are far more manageable than the dozens of Rod songs that appear in a search for simply great American songbook. The NOT term is very versatile. Anyone who had a heart broken in 1973 and wants to avoid listening to all songs released that year can type year:1970-1979 NOT year:1973. That means Elton John’s Goodbye Yellow Brick Road remains firmly out of the picture.